A torrent of retirements over the next 10 years is poised to wreak havoc on the mining labour market in Canada. While the unemployment rate in mining, quarrying and oil and gas has improved in 2017 from the summer of 2016 – from 10% to 7% – the next decade is going to be challenging for the industry as it seeks to replace older workers who are turning in their coveralls and enjoying their golden years. So says a new report from the Mining Industry Human Resources Council (MiHR), which projects 87,830 workers will need to be hired over the next decade under a baseline scenario. If mining expands, the need for miners and associated professions climbs to 130,410, and under a contraction, shrinks to 43,200. 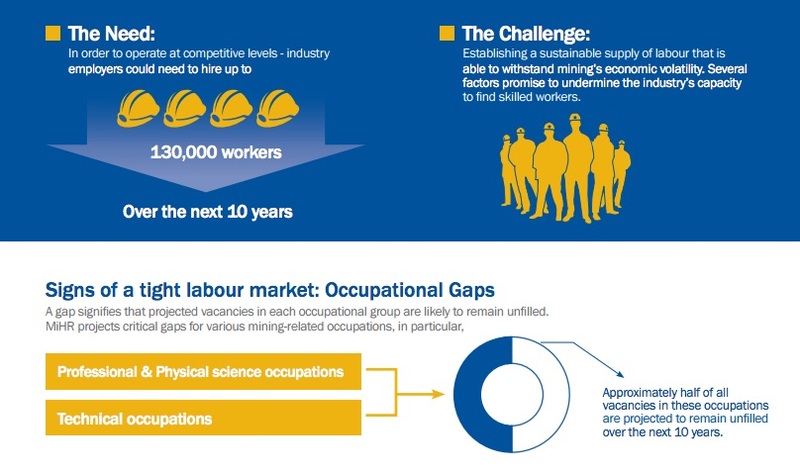 "One of the most significant challenges facing Canada’s mining industry is establishing a sustainable supply of labour that is able to withstand the economic volatility that characterizes the sector," notes the report. The report suggests that there will be a 47% gap (demand exceeds supply) for technical occupations, 56% for supervisors and foremen, 18% for skilled trades and 10% of production workers. According to MiHR’s forecasts, the industry will need to hire roughly 18,210 people in these occupations from 2018 to 2027, but is only expected to secure 8,670 new entrants, leaving a total gap of 9,540 – meaning about half of all vacancies will go unfilled. "This poses a significant risk to mining operations, given that a thin labour supply has the potential to derail projects, drive up the cost of finding workers and ultimately undermine an operation’s ability to run competitively," reads an executive summary of the report. That obviously calls for a new generation in mining, with key education programs needed to improve the labour supply. “The incoming generation of new entrants are vitally important to the health of mining’s future labour supply, especially prospective students,” says the report. It noted nearly half (47%) of hiring requirements will be met by retiring workers, which places a significant burden on employers. "Each retiree takes with them a unique set of skills and knowledge, and those leaving with experience create a void that is difficult to fill," says MiHR. Age and retirement: Older workers have surged from 11 per cent in 2007 to 16 per cent in 2016, while younger workers have dropped from 13 per cent to 5 per cent over that same period. Lack of gender parity: While women represent nearly half of the Canadian labour force, they make up only about 19 per cent of the labour force in mining. Economic volatility: economic downturns and upswings result in widely fluctuating demand for labour and this instability can affect a mining employer’s ability to secure labour. Remoteness: Mining operations often exist in remote parts of the country with extremely low populations lacking skills. It is common for employers to source workers from other regions of Canada.